The Islamic finance industry is benefiting from a lack of confidence in the conventional banking sector and is expanding rapidly in emerging markets. The global financial crisis has forced bankers and regulators to reexamine the connection between real economic activity and the financial world. Islamic finance has gained credibility in recent years for its grounding in productive economic activity, its ban on speculation and interest, and its insistence on fairness and risk-sharing. Most important is the asset-backing of shariah-compliant financial transactions, which adds to the perceived safety of Islamic banking. The impact of the upheaval was far from universally positive, though. The debt problems of Dubai and a handful of Islamic investment banks, for example, temporarily slowed the advance of Islamic finance and took some of the shine off its image. The issuance of sukuk, or the equivalent of Islamic bonds, declined by almost 25% last year, and most of the sales were centered in Malaysia. Saudi Arabia, with its growing oil revenue and increased government spending, could tip the balance toward the Arab Gulf in 2011, with a healthy pipeline of sukuk issues resulting. This assumes, however, that market conditions in the region will not remain unsettled by the political turmoil sweeping the Middle East and North Africa. Meanwhile, Malaysia’s central bank, Bank Negara, is helping the International Shariah Research Academy for Islamic Finance to develop new rules for derivatives. The rules are intended to ensure that Islamic lenders use derivatives only for hedging by requiring proof of an underlying economic transaction. 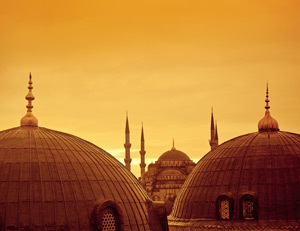 Interest in Islamic finance continues to grow, especially on the retail side of the business. Growth opportunities in emerging markets are attracting increasing investments, particularly in Asia and Africa, where there are significant Muslim populations lacking access to financial services. The assets of Islamic banks in Pakistan expanded by 30% in 2010, according to the State Bank of Pakistan. Investments of the sector rose by 96%, as the central bank began regular quarterly issues of sukuk that will total $2.1 billion this year. Afghanistan’s central bank expects an Islamic banking law to be enacted by September. The global market for Islamic financial services is growing at a double-digit pace once again, although it only recently regained the $1 trillion level previously reached in 2007. The market’s potential is at least $5 trillion in the long term, and the industry is continuing to expand globally, according to Moody’s Investors Service. Although the Islamic investment banking sector in the Middle East took a hit during the financial crisis and remains in search of a new business model, many Islamic financial institutions have evolved into one-stop, universal banks that are gaining market shares in Muslim countries. 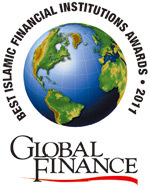 The fourth annual Global Finance Islamic Financial Institutions Awards honors the leading shariah-compliant institutions in the regions, countries and product areas in which Islamic banking has an established or growing presence. The awards are based on extensive consultations with bankers, analysts and industry experts but ultimately are the decision of Global Finance’s editors. The criteria incorporate a range of subjective and objective factors, including customer service, growth in assets, profitability, geographic reach, strategic relationships, new business development, innovation in products and the bank’s financial stability.